Source: Via an email form a relative. East of Vimy on the morning of May 9th, 1917. For conspicuous gallantry and devotion to duty in action. During the morning of the 9th of May the enemy made a most violent attack on the Battalion to our right. No communication being possible between Bn. H.Q. of the attacked Bn. and Flank Battalions or Brigade, this N.C.O. was sent out to gather whatever information possible. He proceeded through intense shell-fire to H.Q. of the attacked Battalion and thence forward, returning with the most valuable information. During the operation he made several such reconnaissances working all the time under the most difficult conditions owing to the prevalance of enemy gas and severe shell-fire. June 21, 1886 Born Born at High Halstow, Rochester, Kent, England to William Randall. September 18, 1915 Enlist Private Randall joins the 82nd Battalion in Calgary listing his father as his next-of-kin. His trade is that of a trapper and hunter. He is 29 years old. September 1915 to May 1916 82nd Battalion Serves (trains) with the 82nd Battalion. May 20, 1916 Embarks for England Point of embarkation Halifax, Nova Scotia via S.S. Empress of England. June 23, 1916 Transferred To Canadian Machine Gun School, Risborough Barracks. October 13, 1916 Transferred To 18th Battalion. October 15, 1916 Canadian Base Depot, Etaples France In transit to his unit. October 12, 1916 Military Will Private Randall bequeaths his real and personal estate to his father, William Randall, resident at High Helstow, Rochester, Kent, England. May 28, 1917 Wounded G.S.W. Wound, head, slight. No. 2 Australian Hospital, Wimereux, France. June 3, 1917 Wounded S.W. head and left buttock. Transited to England via the H.S. Jan Breydel. June 4, 1917 Wounded G.S.W. left hand. June 4, 1917 Wounded Admitted to Military Hospital, Endell Street, London, England. For conspicuous gallantry and devotion to duty in action. During the morning of the 9th of May the enemy made a most violent attack on the Battalion to our right. No communication being possible between Bn. H.Q. of the attacked Bn. and Flank Battalions or Brigade, this N.C.O. was sent out to gather whatever information possible. He proceeded through intense shell-fire to H.Q. of the attacked Battalion and thence forward, returning with the most valuable information. 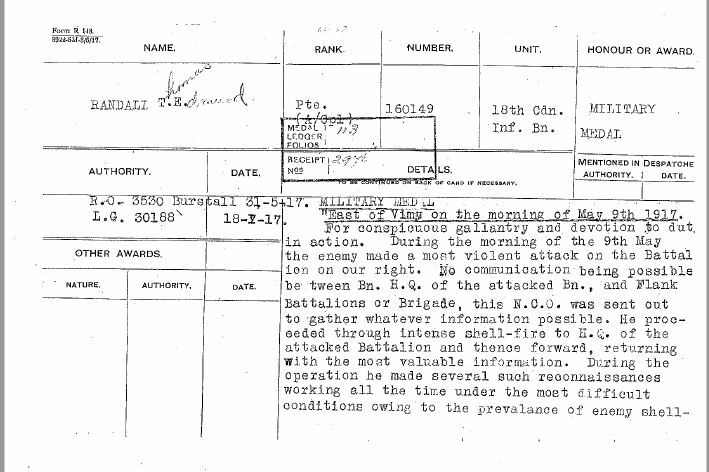 During the operation he made several such reconnaissances working all the time under the most difficult conditions owing to the prevalence of enemy gas and severe shell-fire. June 9, 1917 Wounded Canadian Convalescent Hospital, West Park, Epsom. June 11, 1917 Wounded Taken on Strength, Western Ontario Regiment Depot, Bramshott, England. August 22, 1917 Marriage Married to Olive Mabel Piper, English spinster at Liphook, Hants. Spencer C. Piper and Miss Mary A. O’Neill as witnesses. The attending chaplain is Honourary Captain J.C. Wilson, C.E.F. December 1, 1917 Separation Allowance Separation allowance of $25.00 per month assigned to his wife, Olive, who is residing at 27 Trimworth Road, Folkestone, Kent, England. Stopped effective January 10, 1919. December 19, 1917 “On Command” Witley, England. June 17, 1919 Taken on Strength Perm. Cadre Reference to N-Wing (unknown). June 23, 1919 Stuck of Strength and Taken on Strength N-Wing Permanent Cadre to R-Wing but remains attached for all purposes. August 27, 1919 Taken on Strength Witley. September 6, 1919 Embarked for Canada Embarked for Canada at Tilbury. September 19, 1919 Dispersal Station “R”, No. 13 Military Depot Medical for military discharge completed. September 23, 1919 Taken on Strength, No. 13 Military Depot Calgary, Alberta. September 23, 1919 Discharged, No. 13 Military Depot Calgary, Alberta. December 20, 1974[i] Passes away Colonel Belcher Hospital, Calgary Alberta. [i] Record of cremation on December 23, 1974 at Leyden’s F. Home, Calgary, Alberta. Registration number 9252.